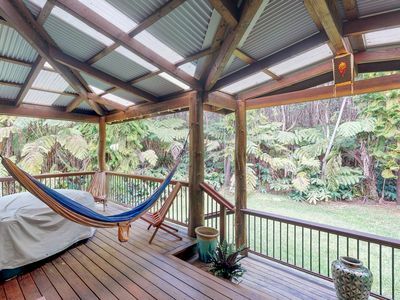 Quiet Cottage on 20 acres of Paradise. 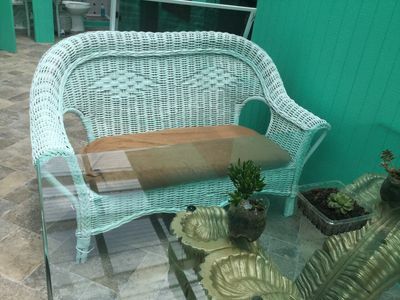 Ocean views, water falls, total privacy. 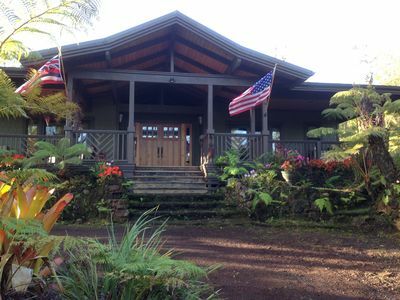 Storybook 1-bedroom ocean view cottage welcomes guest to be immersed in nature and beauty on 20 private, gated acres. 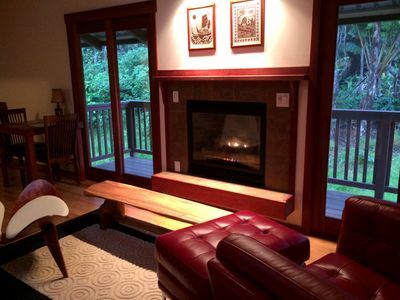 Perched above a spring-fed babbling brook, the Creekside Cottage offers the peace, serenity, privacy and nature that will melt away your stress. 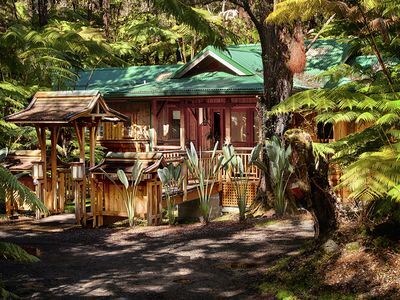 Our property offers the peace, serenity, privacy and nature that will melt away your stress. 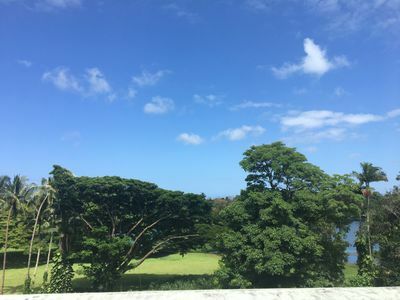 We are located 10 miles (15-20 minutes) from downtown Hilo, on the lush and scenic Hamakua Coast of the Big Island with stunning ocean views. 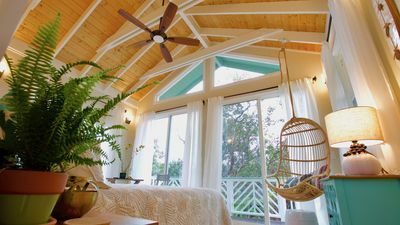 The cottage is perfect if you’re looking to escape tourist traps and the hustle-bustle of city life and relax in the vibrant natural environment of authentic Hawaii. 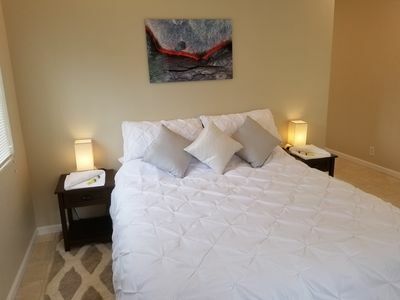 The property has one queen-sized bed, making it ideally suited for two people. If you're traveling with small children, there are two child-sized foldout floor mattresses in the living room. 1 full bathroom plus 1 half-bath. Fully equipped kitchen. 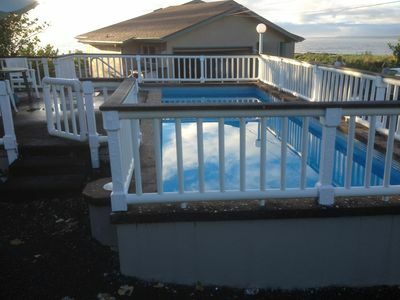 Screened-in lanai. Enjoy the property’s private waterfall and swimming hole below it. No city lights to dim the night sky: great star-gazing! Utter peace and quiet - no traffic noise, no city sounds, no nearby neighbors. Absolute privacy: between you and the nearest road is a eucalyptus forest. 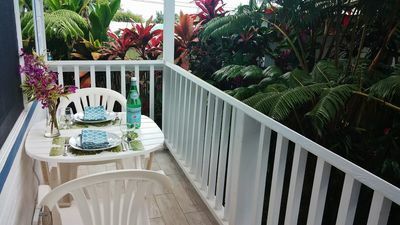 - Sweeping ocean views from the screened-in lanai. 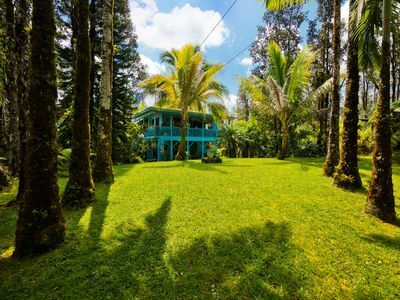 - Surround yourself in nature and tropical beauty in all directions. 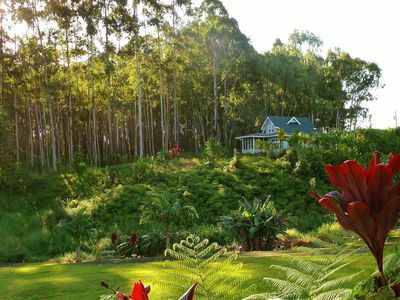 - Rolling gardens, including an orchard of fruit trees, banana groves, lilikoi (passion fruit) and pineapples. - 15 acres of replanted forest land. - Private waterfall with a natural swimming pool beneath it. - Nearly a mile of private road behind the gate for running or walking. 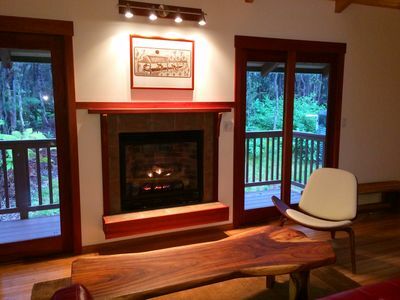 The climate at Creekside Cottage is perfect year round. 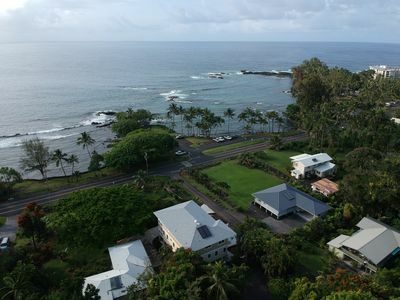 Situated at 900 feet elevation, the air is cooler than at the beach or in Hilo: upper 70's F to low 80's during the day, and upper 60's F to low 70’s at night most of the year. In the winter it can get down to the low 60's at night with a daytime high in the low to mid-70's. 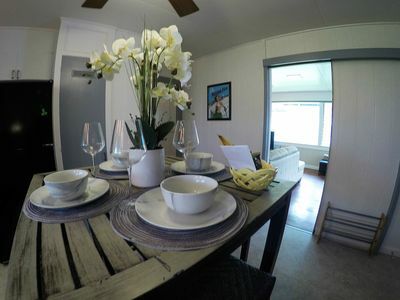 The property is very rural which means you can use this time to truly unplug, but we do have options available should you choose to stay connected. We do not have a landline phone, but most cell phone carriers work pretty well in the area. Cable TV is not available in our neighborhood, so we have satellite Internet for the WiFi and streaming TV service (DIRECTV NOW with HBO GO) through a Roku. While the Internet coverage generally works well, it can be slow or cut out completely, especially during bad weather. 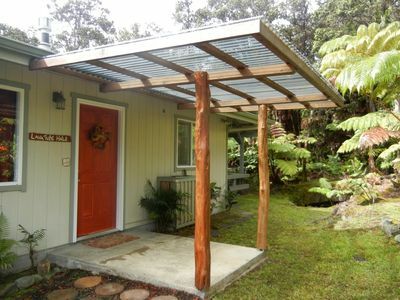 Water is provided from Hawaiian rainwater purified by filtration and UV light. Propane tanks supply the gas for the stove, hot water heater and dryer. 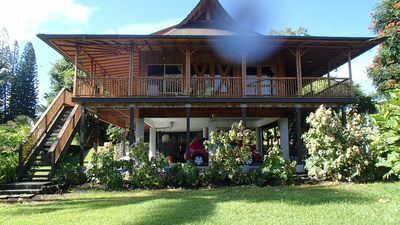 Like most homes in Hawaii, there is no air conditioning or heat on the property, but the home’s temperature can be regulated through the many windows which catch the cool ocean breezes. It rarely gets hot at this elevation, and the nights always cool down to 70 or below. If heat and humidity are a problem for you or your guests, you may wish to rent an air-conditioned hotel room. You'll have the cottage to yourselves. 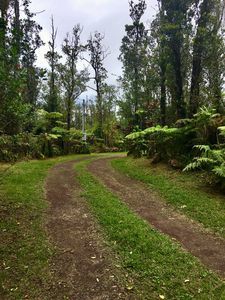 You'll share the 20 acres with the guests of our other vacation rental, but there is little chance you'll see or hear them: the Kapehu Retreat House is about 2/10ths of a mile away on the other side of a creek and ravine. 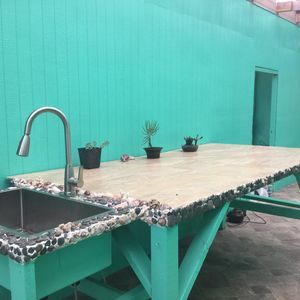 You have access to the fruit trees (oranges, lemons, limes, figs, 3 varieties of bananas, lilikoi, and two varieties of avocados (including the huge "butter" avocados). 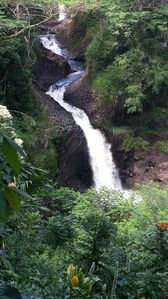 You'll also have access to the path down to the waterfall and the swimming hole below the waterfall in the Kapehu Stream. Amazingly detailed home with lounge area – private location! 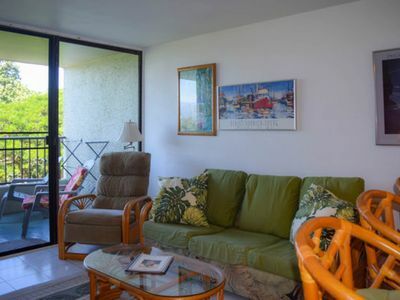 Fifth floor condo w/ lanai, shared pool, & ocean views - steps from the beach!